STUART HYSLOP previews a poignant documentary about the Canadian seamen whose union was destroyed. 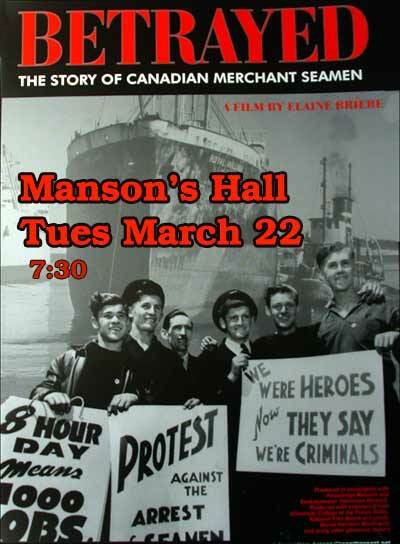 Betrayed is the bitter and tragic story of the destruction of the Canadian Seaman’s Union in the early 1950s. The CSU was a progressive union with a strong and united rank and file membership which had achieved the eight-hour day, paid sick leave and equal pay for “non-white” workers on board ships of the Canadian merchant fleet, which, at the time, was the fourth largest in the world. During World War II, Canadian merchant seamen had paid a high price on the Atlantic convoys, with 1,600 seafarers losing their lives. Their reward, four years later, was the plan to privatise the merchant fleet by the liberal government of Louis St Laurent and to diminish the hard-won CSU agreements covering working conditions on Canadian ships. The CSU opposed the government plans and organised an international strike involving 90 vessels in 26 countries, including Britain, South Africa, Australia, British Guiana, Ceylon, New Zealand, Italy, Holland and many other ports worldwide. The Canadian government, in collaboration with private Canadian and US shipping interests, then instigated a brutal and ideological campaign to discredit the CSU and its members. At the start of the strike, dockers in many ports worldwide supported the Canadian seafarers against the shipowners’ attempts to replace CSU members with scab SIU crews. This entry was posted in Economic, social, trade union, etc., Film and tagged Canada, history by petrel41. Bookmark the permalink.